﻿ Orchid Hotel Hue (Vietnam) | FROM $22 - SAVE ON AGODA! "The staff and facilities were excellent." 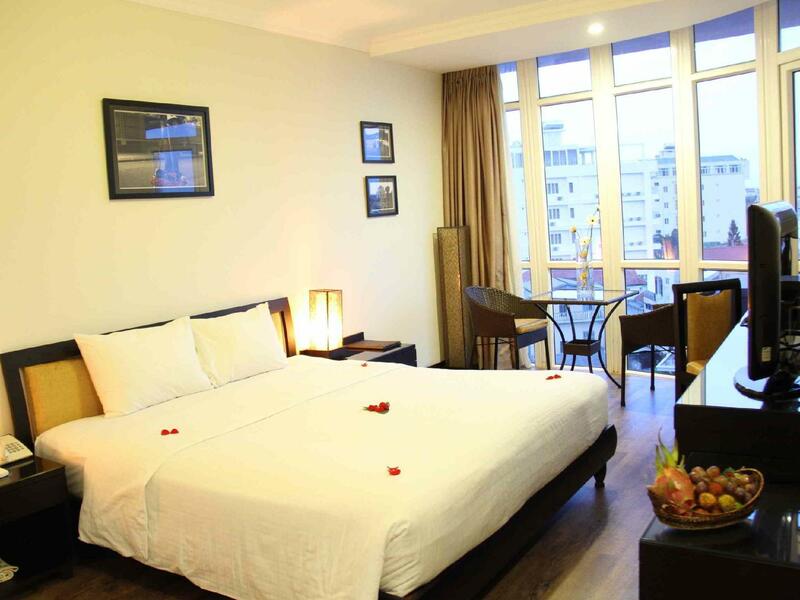 Have a question for Orchid Hotel Hue? 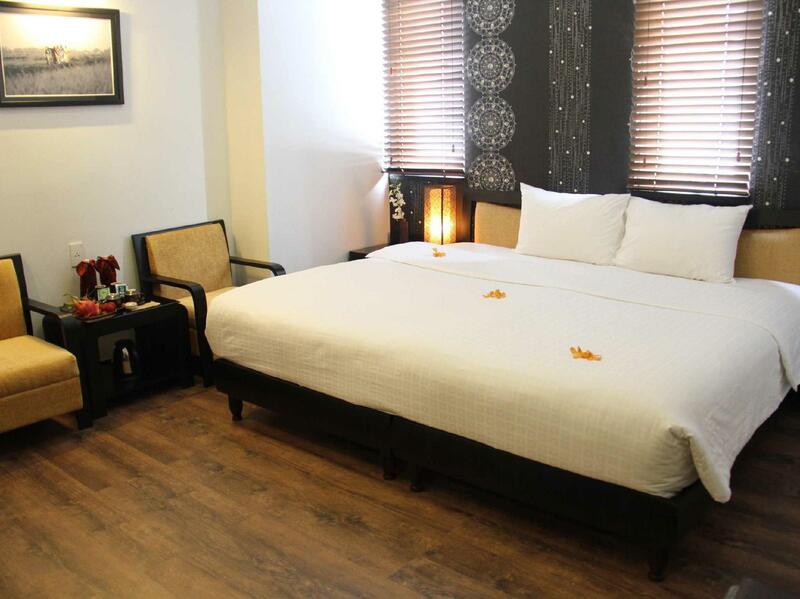 "A very nice hotel to stay, clean and spacious room, with friendly and helpful staffs." "Fresh fruit and welcome drink was served upon arrival." "It was a good clean well appointed hotel in a good location." 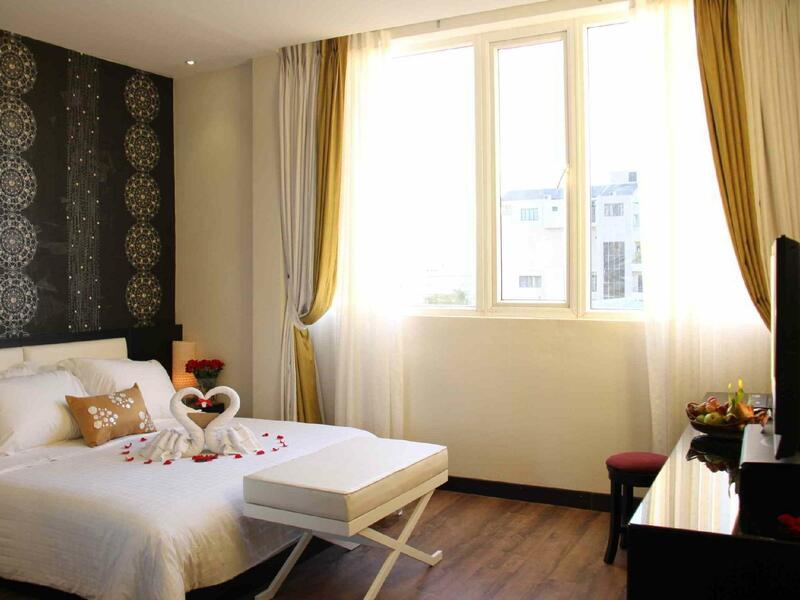 This luxurious boutique style hotel, located within five-minutes of the Huong River, is positioned on a quiet street. Hue can be easily explored through the nearby train station as well as the bus station, providing unfettered access to everything the city offers. 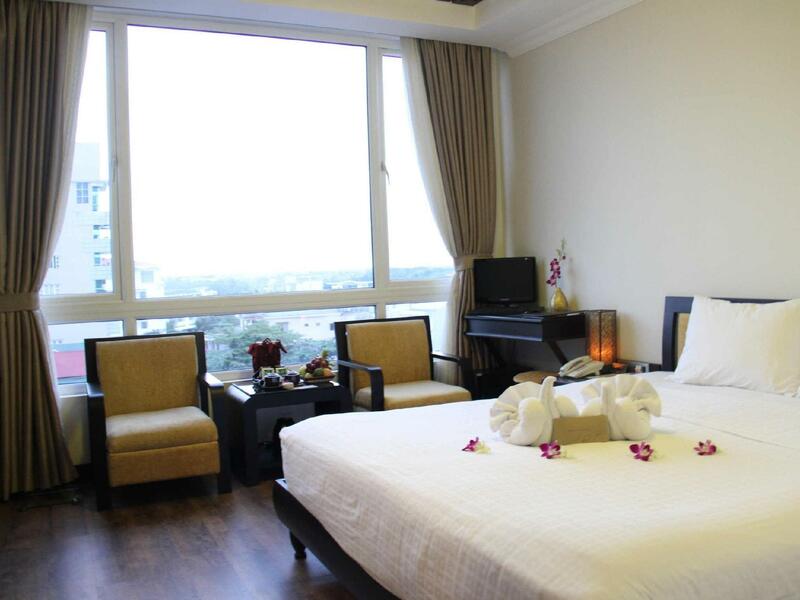 As one of the top rated hotels in Hue, guests can expect outstanding service, elegant decoration, and modern amenities that are well kept. The on-site restaurant serves a meticulous compilation of gourmet cuisine that is professionally prepared by a well-trained cook staff. Business travelers will enjoy a host of great features, such as wireless internet access and a comprehensively equipped business center that provides a perfect venue for working while being away from home. The Orchid Hotel Hue in Hue is the perfect location for those who want a top rated hotel with world-class amenities in a unique and quiet location. Hotel is very nice, staff is superb - nice, friendly and helpful. Thre are so many extras they give - mangoes in room, welcome drinks etc. Breakfast is very nice with lots to choose from. I gave location less point because hotel is in great spot in the central area, but due to that, it's very noisy. I would definetly recommend this hotel! Right from the moment we checked in , they remembered us by name , greeted us with a smile every time we went by . The best service I’ve experienced among all hotels I’ve stayed in . It felt very personal and their breakfast pho was delicious ! The rooms were good sized and clean . Very comfortable bed . This was my favorite lodging during my two week tour through Vietnam. The staff were truly wonderful, and that’s what made it stand out among all others. The location can’t be beat, and breakfast was great, too. At that point in my trip, I was craving a bit of home and there was a nice and delicious mix of local and Western-ish choices that made me very happy. The only thing I’d say is it can get noisy - not from the street, but from the hall/stairwell/mechanicals. Nothing that would deter me from staying again, though - just be prepared if you’re a light sleeper. This is a real gem of a hotel with awesome people - definitely recommended for your stay in Hue! Many eateries, pubs and minimart around the vicinity. Noisy at night. Hotel has no interconnecting rooms for family. They do no replenish the food for breakfast. But the hotel is not crowded so you will still get some food. It's first impression in Hue for me. Good location in walking street even hotel is nearly many club and pub but it's very silent in my room. Beautiful and clean room. And very nice staff who can remember client name! A very nice hotel to stay, clean and spacious room, with friendly and helpful staffs. Fresh fruit and welcome drink was served upon arrival. The air con is strong too, the shower current is strong and have hot water. The breakfast was good. There are many restaurants and cafes around the hotel. Quite convenience. Very clean and nice room, served with welcome drink and fruit! The staffs are quite friendly and helpful. Several cafes and restaurants around the hotel, quite convenient to walk around yourself at night. Breakfast is good, quite a few choices to choose from. Was impressed when we first stepped into our room. The room is spacious and very clean and neat. There's also welcome drink and fresh fruits upon our arrival. The staffs are very friendly and helpful. There are many bars, cafes and restaurants nearby the hotel, really very convenient. And the hotel is easy to locate too. There's many choices to choose from for breakfast, many fresh fruits too. Everything is good! Very friendly and helpful staffs. Very good location. Good breakfast. Room is good for family. The staff were super helpful with everything , the breakfast was amazing! Fruits, cereal , cooked eggs to order, plenty of paistries and bacon and sausages. centrally locates next to a lot of bars and restaurants. Little mix up with my laundry but was sorted and fully comped with no fuss! Great place. We wish we could have stayed longer !! This is a charming little hotel in a fantastic location. At the weekend the street is closed to traffic and it becomes a hive of activity, live music and entertainment and plenty of street side bars. The room is quite small but very comfortable and clean. The staff are very friendly and helpful. The breakfast is quite good for a small hotel and has plenty of choice. There’s a great place across the street to rent motorcycles from (Hue Motorbike Rental) if you fancy a trip to Hoi An by bike. All in all a nice place to stay for a reasonable price. Romantic room was lovely. Location is great. Food little option and cold. Had some issues with the server name mrs chau because of her different treatment issues but because of the hotel management and manager mrs nhung things ended up well. They even surprise us with a free 1 day bike rental when we checked out to make up for it. Also, we only found out on our last day that pickup service is available as mentioned by Mr.Anh a lovely guy but when we called in on first day the lady name Thuy immediately said there isn't and theres no driver and we were all confused during the chat but we cant be bothered anymore. All in all, look for right individuals to help you with a great stay here. A big thanks to sincere and GENUINE Mrs Nhung, Mr.Anh and hotel management that treated us well especially Mr.Anh as he was genuinely friendly to us even before the saga happened. Other staffs was extremely friendly as well but only after the saga. Very good service from all levels of staff. They made you feel at home and try to cater to your needs. Breakfast is superb. Location is great. Rooms are lovely. Would love to come back if in Hue. Great service! The hotel staff takes the time to know and remember your name. It seems like a minor thing but it makes a huge difference! It was a good clean well appointed hotel in a good location. Just be aware that to the Vietnamese, it is common for children to share their parents’ hotel beds so a double and a single is supposed to sleep 4. This was a very nice place to stay in Hue... For the price we got I think is one of the best in town... Good location and great staff... Definitely felt very welcomed in this hotel :) we would od stayed longer, but it was fully booked! I am not prone to superlatives having worked in the tourism industry for two decades, but the Orchid Hotel Hue is simplye one of the most exceptional hotels I have ever been to. I had my own little hotel for 10 years and this hotel would have been an example for me and my staff: the service was simply outstanding. We had a problem sleeping the first night and when we told the staff, they went beyond the call of duty to make it right and apologize. They immediately upgraded the room, sent messages of apology and asked several times if there was anything else. They were simply wonderful. The breakfast buffet is one of the best in six weeks of travel, if not THE best. I congratulate the owner on selecting and retaining such employees. 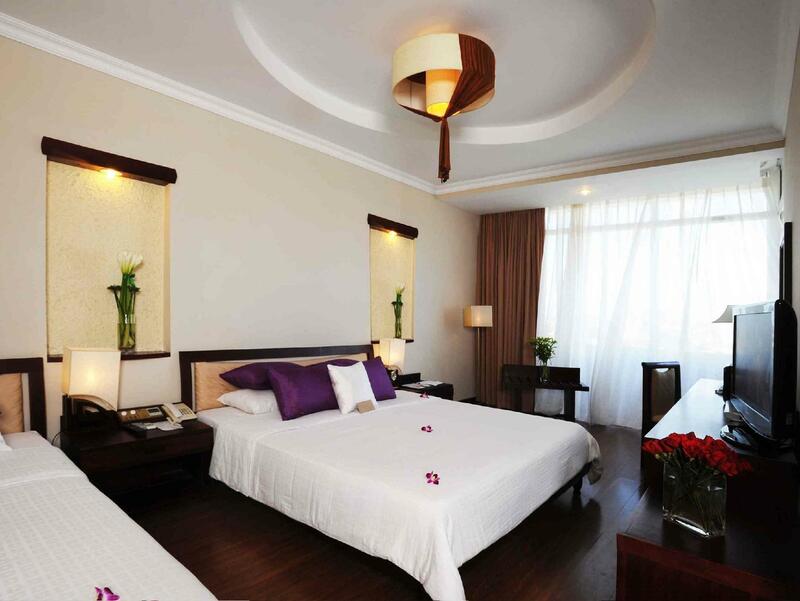 Orchid Hotel will be my hotel on my next visit to Hue and I will recommend it to anyone I know who is travelling there. Everything is just perfect! We didn't expected for such great facility and service for the price so everything just surprised us. If we have another chance to visit Hue again, will definitely choose this hotel again.